The weather was very cooperative for a ten mile walk today. It was in the mid-60s with a light breeze when I left the house, and 77 with a strong breeze by the time I got home. It was warm enough for shorts, but never got anywhere near uncomfortable. Well, other than after I stopped and had lunch. I knocked off the first six miles at a pretty good clip, hovering around a pace of 18:15/mile, which for me is zippy. 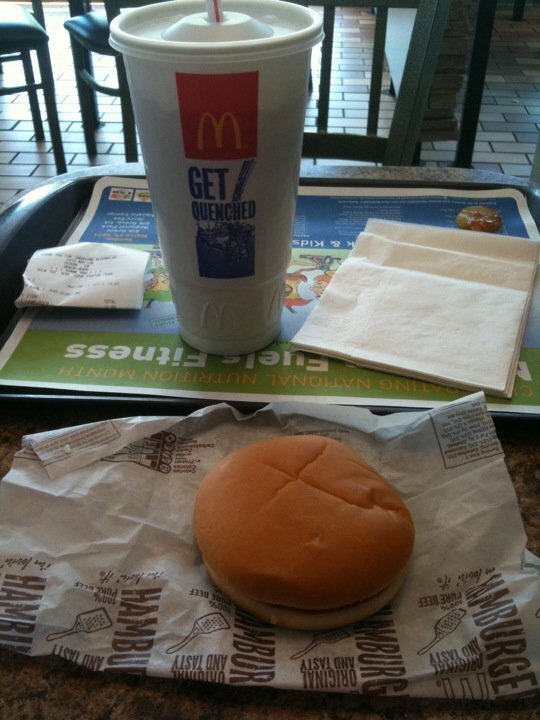 I was right in front of McD's at that point, so I went in to make use of the facilities, and decided I'd better eat something, so I grabbed a burger and a drink. Usually, this is not a problem. 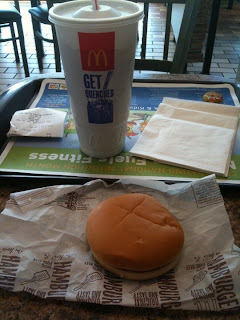 Other food rears back and attacks me if I eat and then start walking around, but I have a good track record with the little burgers...though the last time I got one it didn't set well with me, and this time I got half a mile from McD's and turned around to go back before horrible, awful things happened. I sat down for another 25 minutes or so to make sure it had passed, and headed back out for the last 3 miles. Uneventful, the way I like it. I may have to find something else to eat along the way if the burgers are going to start being a problem. It won't be an issue with tomorrow's 6 miles, but next weekend's 11...I may need to figure it out before then. On the non-food front, so far this year my feet are holding up. They're sore at the end of the longish walks, but I haven't had any blister issues yet. Fingers crossed that it stays that way. Where have I been? I missed your great posts! Speaking of great ... Your training walks are impressive. I am only walking once a week these days. The feet are hurtng. I am pretty sure I have plantar in the right foot. This would be a good week to see the podiatrist. School is out in a few weeks and then let the training begin! Are you coming to Atlanta?